Creature Creatine Complex by Beast Sports Nutrition is made to unleash the beast inside of you. It contains a blend of five of the most advanced forms of creatine to fuel muscle growth and increase strength. It helps stimulate lean muscle mass and prevents muscle breakdown to enhance recovery so you can push harder, go faster, and recover quicker. Beast Sports Nutrition chooses ingredients with the highest purity to absorb faster directly into your muscle cells and prevent bloating and discomfort so you can keep going strong. 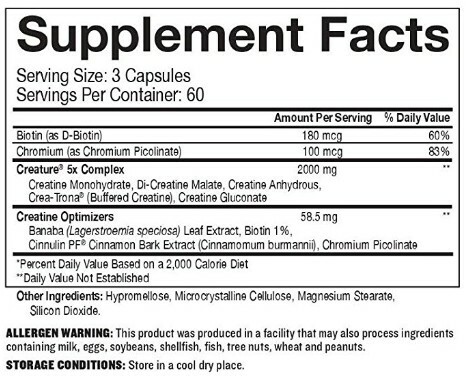 As a dietary supplement, take 3 capsules 30 minutes prior to workout and 3 capsules immediately after workout. Always take with plenty of water. On non-workout days, take 3 capsules in the morning and 3 capsules in the evening. CHECK WITH A QUALIFIED HEALTHCARE professional before using this product, or any dietary supplement, if you are under the age of 18 or if you have any known or suspected medical condition(s) and/or are taking any prescription or OTC medication(s). Do not use if seal is broken or missing. KEEP OUT OF REACH OF CHILDREN.